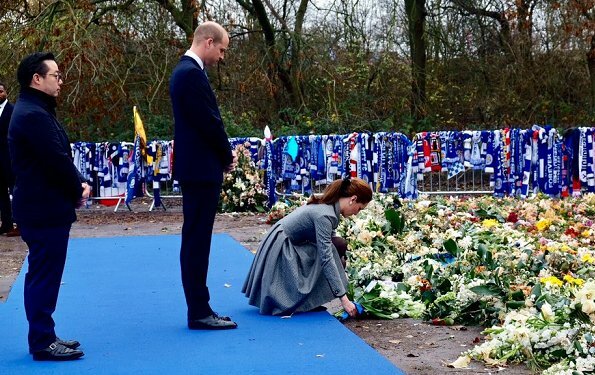 On November 28, Wednesday, The Duke and Duchess of Cambridge visited Leicester city to pay tribute to those who died tragically in the helicopter accident at the city’s Football Club’s King Power Stadium. 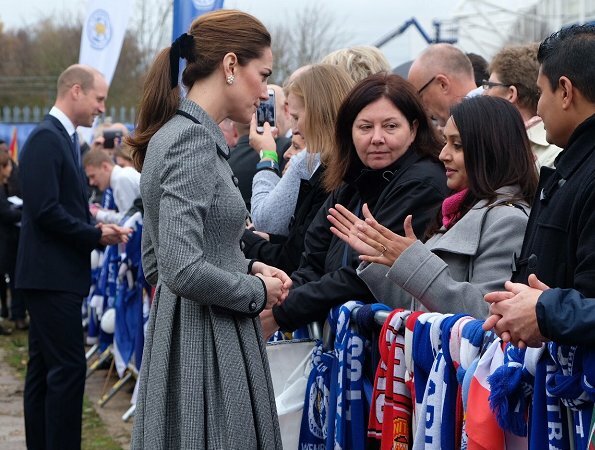 The royal couple firstly visited the tribute site near the stadium and then met with players and members of the club's management team. 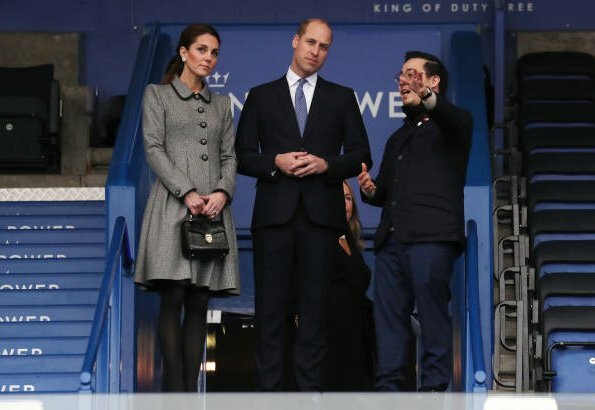 Afterwards, The Duke and Duchess visited King Power Stadium and there, they met with representatives from local charities that were supported by Khun Vichai. She looks fabulous. 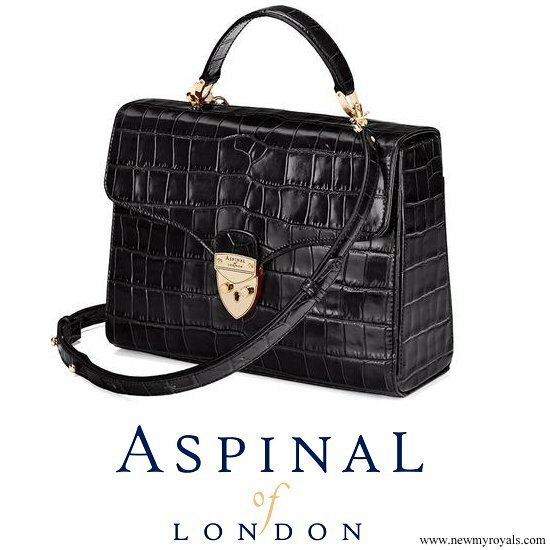 Very well made coat, amazing bag, sensible shoes and cute hair. Very lovely and Classic Kate. Beautiful, I like it all, coat dress, shoes, bag, hair and her attitude. Well said, agree with it all!! Yes, her attitude. Poised, regal, elegant yet approachable and genuine and interested. I like it all too. Splendid choice & fabulous look! Totally agree with you. Some people are (or get) bored about her coat dresses, but I think that they suit her very well and it's also typical her style. Very elegant and regal! I also love the fact that she always dresses for the occasion. For an event like this, sober and modest. 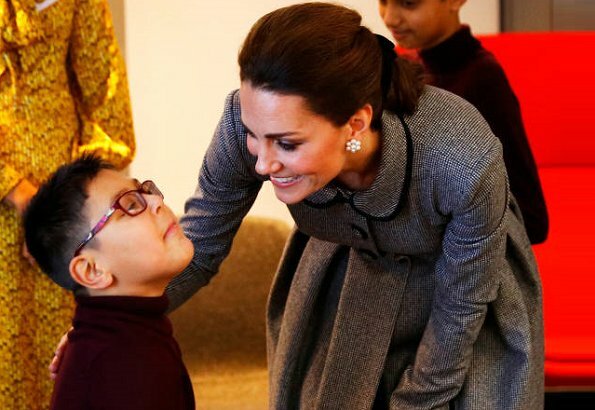 And yes, her attitude... you go, dear Catherine! 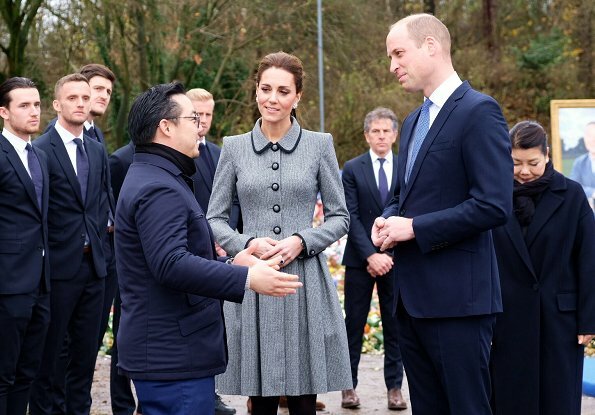 Ich glaube, dass Catherine dieses Kostüm schon einmal getragen hat, als sie im August in Schottland zusammen mit der Queen zur Sonntagsmesse gefahren ist. 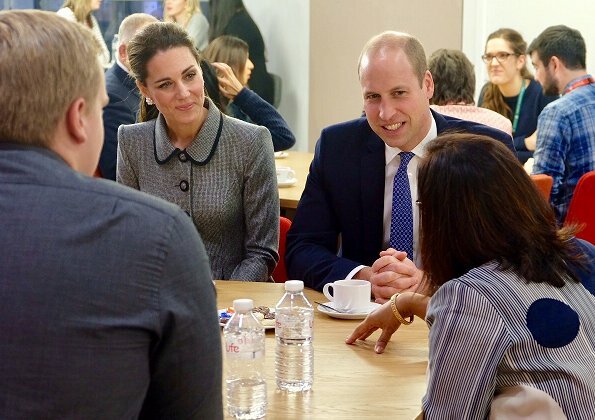 They really do look like the future King and Queen here. All that's missing is the brooch. Agree. Every inch the future king and queen! Agree. They look superb and this coat dress looks great and is perfect for the occasion. 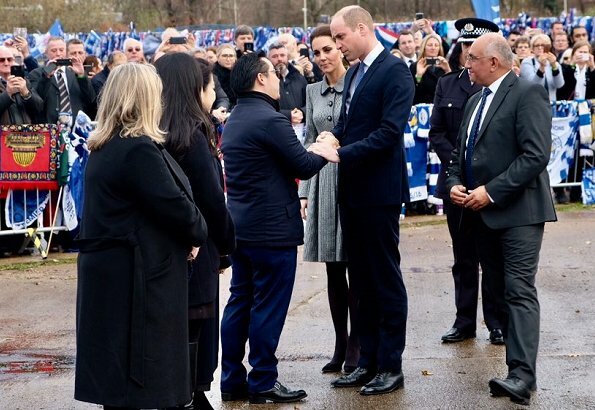 What a nice moment to remember the victims of the helicopter crash. 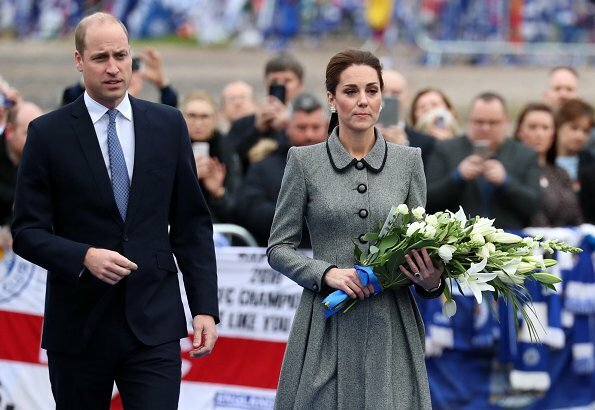 Also an ocean of flowers.Kate's outfit was just right for this occasion, she looked wonderful. J’aime pas du tout ça la vieillit !!!! Les cheveux attachés lui vont beaucoup mieux. Coat is nice, but it does not fit very well. I like the ponytail but Kate's make up is very heavy. She would look much more fresh with lighter make up. Les cheveux attachés lui vont beaucoup mieux . She needs to do something with het hair. It looks tired and dull and colouress. Boring and predictable, both of them. Also, Catherine is just too thin. In contrast, CP Mary is slim, but she is shapely. 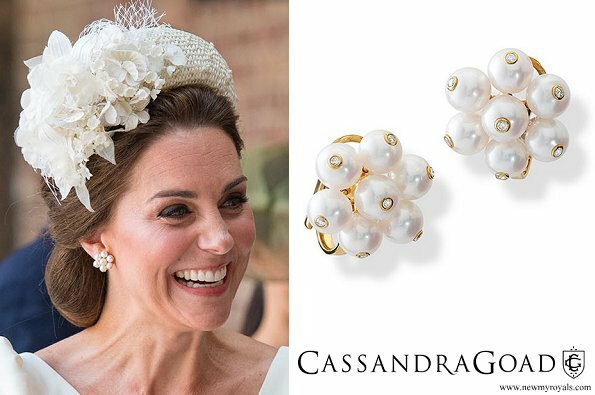 Catherine does not have the body to bring her clothes to life, so for me she's not exciting to see, in contract to CP Mary/Mette-Marit/Countess of Wessex/Letizia (thin but shapely). Great dress, nice hairstyle, healthy looking hair, perfect makeup. 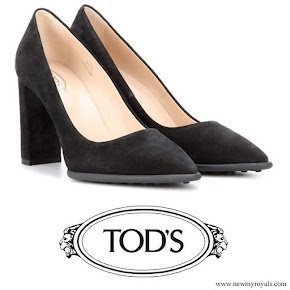 Classic and chic! A few months after she had her third child - and she has such a tiny waist! How on earth is she doing this?? She looks lovely, but a bit tired. Catherine looks lovely. Always immaculately groomed and her clothes fit her beautifully. She looks regal, elegant and poised. 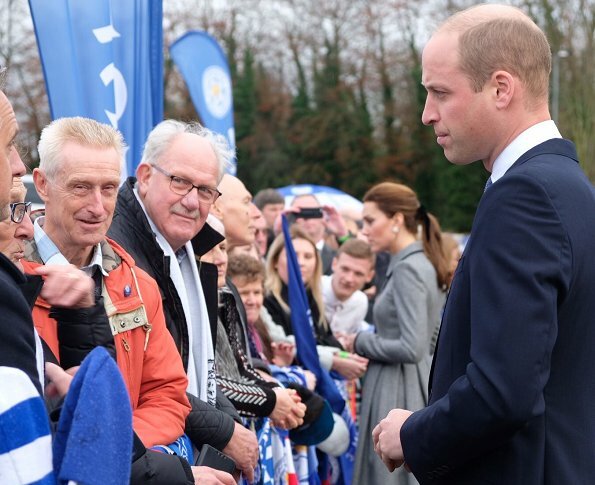 Catherine is such an asset to the royal family. A very nice look and i like her hair back like this off her face. ik vind het een leuk stel, altijd goed gekleed!!! !